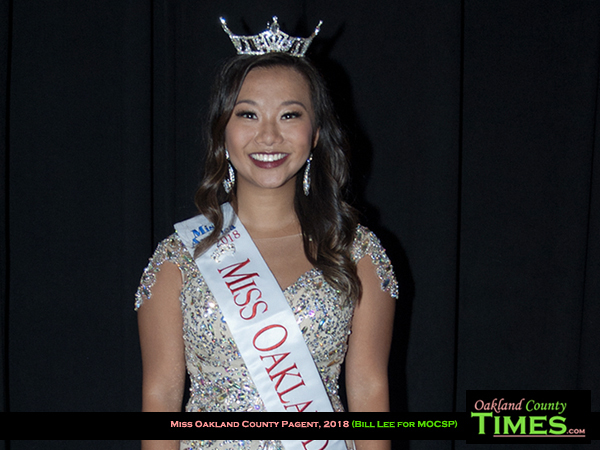 Rochester, Northville, MI — Vivian Zhong, 21, of Northville was crowned Miss Oakland County 2018 at the annual pageant held July 14, 2018 at Oakland University’s Dodge Auditorium. The new Miss Oakland County won a $1,150 education scholarship as well as several other prizes and scholarships awards. She will represent Oakland County at the 2019 Miss Michigan pageant in Muskegon next June. Ms. Zhong is entering her senior year at the University of Michigan, where she seeks a B.S. degree in biopsychology, cognition and neuroscience. Vivian’s personal platform is “Integrating Tradition — Bridging the Generational Gap”. Pageant newcomer Grace Whan, 18 of Birmingham, a freshman at Pace University in New York City, captured an $800 scholarship as the First Runner Up. Whan also earned the pageant’s Talent Award and an additional $175 scholarship for her lyrical dance performed to “Love is Alive”. She also won the Lifestyle and Fitness Award for which she received a $100 scholarship. Shelby McPherson of Shelby Twp., a 24-year old Lawrence Tech graduate, was the Second Runner Up, earning a $700 scholarship. Erica Kennedy, 21, of Lapeer and Oakland University won a $600 scholarship as the Third Runner Up. Also on Saturday, Kylie D’Andrea,13, of Macomb Twp. became the 2018 Miss Oakland County’s Outstanding Teen. She competed with her personal platform, “Ignited in Faith”. She will represent Oakland County at Michigan’s Outstanding Teen competition next June in Muskegon. The Miss Oakland County Scholarship Program is a preliminary pageant to Miss Michigan and Miss America. It provides scholarship opportunities to women that either work, live or attend school in Oakland County. The Miss America Organization is the largest existing scholarship organization for young women between the ages of 17-24, making available over $45 million in scholarships each year. All results from the Miss Oakland County and Miss Oakland County’s Outstanding Teen follow. Miss Oakland County offers $5,064.50, including $4,750.00 in educational scholarships. 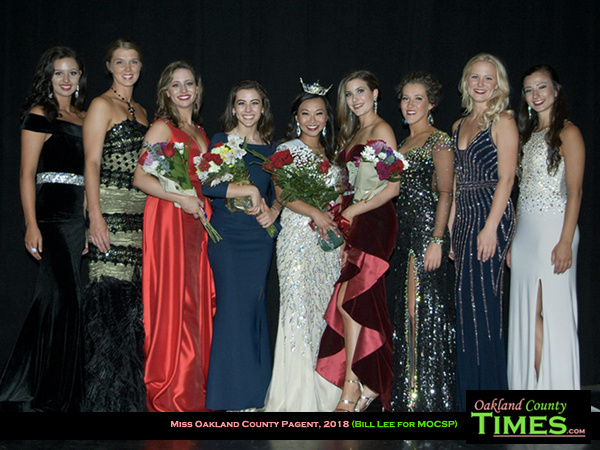 Miss Oakland County 2018, Vivian Zhong, receives a $1,150 education scholarship, $239.20 Children’s Miracle Network award, $500 wardrobe fund toward Miss Michigan and several other gifts and prizes. 1st Runner Up ($800 education scholarship): Grace Whan. 2nd Runner Up ($700 education scholarship): Shelby McPherson. 3rd Runner Up ($600 education scholarship): Erica Kennedy. All five Non-Finalists received a $100 education scholarship. Kelly Garver-Nieto Talent Award ($175 education scholarship): Grace Whan. Sponsored by Sheryl’s School of Dance. Kirsten Haglund Lifestyle & Fitness Award ($100 education scholarship): Grace Whan. Sponsored by Kirsten Haglund Foundation. Under new Miss America rules, this was the last year of the so-called “swimsuit” competition. Non-Finalist Interview Award ($100 education scholarship): Grace Newlin, Farmington Hills. Sponsored by Krizanic Family. Samantha Steckloff Service Award ($50 education scholarship): Kristin Penrose, Lake Orion. Sponsored by Samantha Steckloff. JoAnn Lingenfelter Spirit of Miss America Award ($100 education scholarship): Erica Kennedy. Sponsored by Agnes Hutnik. People’s Choice Award ($100 Visa gift card): Jaymie Ziegler. Sponsored by Marian Zadora. Miss America Scholar Award ($150 education scholarship): Jaymie Ziegler, Novi. Sponsored by Krizanic Family. Miss Oakland County’s Outstanding Teen 2018, Kylie D’Andrea, receives a $150 scholarship.